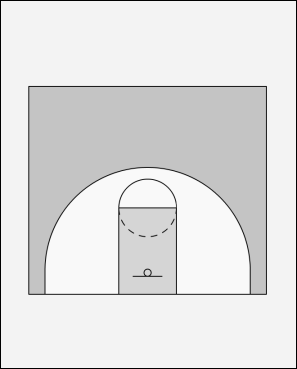 Player 1 starts with ball at the elbow on one side of the basket. Coach sets clock for 1 minute. At go, the clock starts. The player 1 shoots from the elbow. After shot, player 1 moves to opposite side elbow. Player 2 rebounds the shot and passes to Player 1. Player 1 shoots and moves to the opposite elbow. Player 2 rebounds and passes the ball to Player 1. This continues, with shots as quick as possible, until the clock runs out. Keep track of shot attempts and shots made.